A quick review of the levels of protein structure. 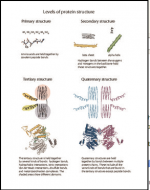 This handout shows the primary, secondary, tertiary, and quaternary levels of protein structure, made with images from molecular models. The handout also describes the kinds of bonds that are most important in each level of structure. Useful for studying proteins in biology, biochemistry, bioinformatics, genetics, molecular biology, and microbiology. This item can be purchased through the Digital World Biology TpT store.